Carlos Murillo, winner of the 2018 Kernodle New Play Award. FAYETTEVILLE, Ark. – The Department of Theatre in the J. William Fulbright College of Arts and Sciences has announced Carlos Murillo as the winner of the 2018 Kernodle New Play Award. Murillo received the award for his play Killing of a Gentlemen Defender. The reading committee — composed of graduate students, faculty members, and area theatre-makers, also named EllaRose Chary's play The Lake and The Mill as a finalist. The contest, named in honor of University of Arkansas faculty member George Kernodle, had over 150 submissions in 2018 demonstrating the abundant diversity of new work being created by playwrights across the country. Killing of A Gentleman is a funny, provocative, ambitious drama that artfully connects — through the magic of theatre and soccer — the underserved communities and kids of current day Chicago with the cartel-riddled neighborhoods of Columbia in the early nineties. When Martin, a theatre maker of Columbia descent, is hired by a Predominately White Institution to work with a youth ensemble from disadvantaged South Side neighborhoods, he refuses the PWI's desire to make a play with the kids that directly addresses gun-violence in their neighborhoods; instead he dribbles more metaphorically around the issue focusing on the 1994 World Cup in Chicago, where a highly respected Columbia team was beat by the fledging USA team after one of their star defenders, Andres Escobar, accidently scored a goal on his own team. The play energetically examines the real-life consequences of structural racism and finding yourself stuck in the wrong place at the wrong time, whether that be on the soccer field, or in a South-Side neighborhood in Chicago. Murillo's plays have been widely produced throughout the U.S. and Europe. His plays include his trilogy, The Javier Plays (53rd State Press), Augusta and Noble, dark play or stories for boys, Mimesophobia, A Human Interest Story, and others. His newest play, I Come from Arizona will premiere this fall at Children's Theatre Company in Minneapolis. 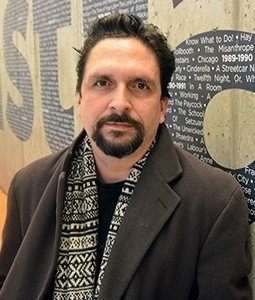 Murillo is the recipient of a 2015 Doris Duke Impact Award for his work in theatre, as well as a Mellon Foundation National Playwright Residency at Adventure Stage in Chicago. He is currently working on a commission for Oregon Shakespeare Festival's American Revolutions initiative. He is an alumnus of New Dramatists and heads the B.F.A. playwriting program at the Theatre School of DePaul University where he is a full professor. Read more at carlosmurillo.net. About the Department of Theatre: The University of Arkansas Department of Theatre has been providing exciting and affordable live theatre for more than 60 years. The department combines a first-rate theatrical education full of hands-on experience with a wide selection of titles to challenge students and delight the community. The department offers the Bachelor of Arts degree in Theatre, a broad spectrum program in the context of a liberal arts education, and the Master of Fine Arts degree in six concentrations: Acting, Directing, Playwriting, Costume Design, Scene Design and Lighting Design. Classes at both undergraduate and graduate levels are focused on providing a strong, professional orientation to theatre performance and technology in conjunction with appropriate research-based coursework to address the required foundations in theatre history, dramatic literature and dramatic criticism.